Fine example of Chinese Qing regional cartography. 長樂縣全圖 / Complete Map of Changle County. A finely executed c. 1800 late Qing Dynasty Chinese manuscript map of Wuhua County in eastern Guangdong Province, China. 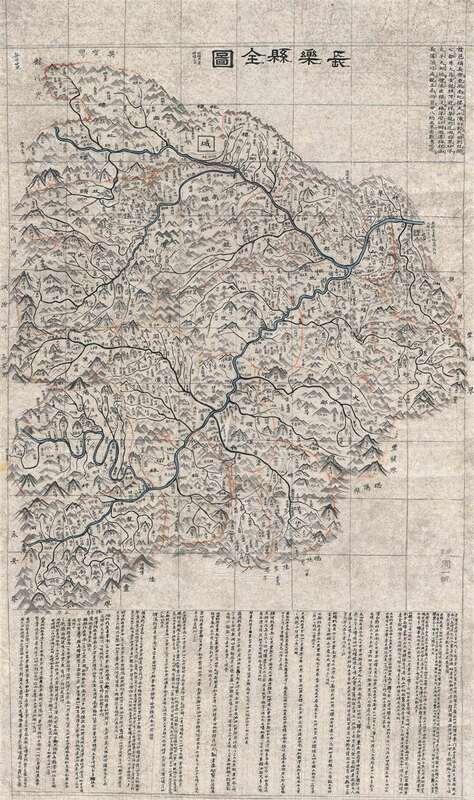 The map, which uses the Qing name of the region, Changle County, was composed by an anonymous Chinese cartographer, probably a regional government official. The map details the course of the Meijiang River as it divides into the Wuhua River, flowing to the northwest, and the Qinjiang River, flowing to the southeast. It labels numerous villages as well as many of the area's famous mountains, including Ma'an Shan, Yanwei Shan, Guija Shan, Dongshan Shan, among others. A major walled city is illustrated near the divergence of the Wuhua and Tanxia Rivers, roughly in the location of modern ay Huachengzhen (华城镇). Orange borders define township divisions, with some 400 villages noted. Extensive textual annotation in the upper right and along the bottom of the map, describe the governing structure of the region, giving some hint to the map's intended administrative purpose. Penciled in gridlines betray the hand of the cartographer and suggest this map may have been copied from another. Chinese administrative maps from the late Qing are extremely rare and almost never appear on the market. The map is undated, but from the style, paper, content, and workmanship, we can loosely date it to the late 18th or early 19th century. An exceptional opportunity. Good. Some spotting. Backed on archival tissue. Manuscript.